Grey Partridge (Perdix perdix). Male. Taken at Abingdon, Oxon., on June 1st 2011. Male. Taken at Abingdon, Oxon., on June 1st 2011. 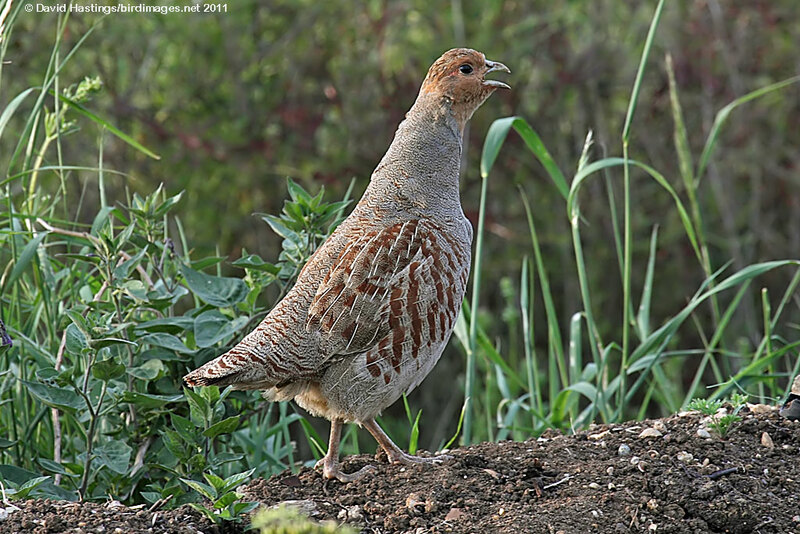 The Grey Partridge is a rotund bird, brown-backed, with grey flanks and chest. The belly is white, usually marked with a large chestnut-brown horse-shoe mark in males, but also in many females. The only major and constant difference between the sexes is the so-called cross of Lorraine on the tertiary coverts of females - these being marked with two transverse bars, as opposed to the one in males. It is mostly found in England, eastern Scotland and central Ireland. It breeds in open farmland with some hedges and other shelter, preferably in or near cultivated fields. It is gregarious, and flocks keep tightly together. Birds are generally nervous and wary. Once a very common and widespread species, it has undergone serious declines throughout most of its range due to intensive farming. Numbers have fallen by 85% in the last 25 years. It is therefore on the Red list of endangered species. There are only around 75000 breeding pairs in the UK.